This is the vision of a new Māori language strategy called the Maihi Māori. It was developed by and for iwi, Māori and Māori language communities. Earlier this year Te Mātāwai met with all stakeholders nationwide to gather feedback on Māori language initiatives in homes and communities, their aspirations for te reo Māori and the role of Te Mātāwai in realising these aspirations. Te Mātāwai was established under Te Ture mō te Reo Māori 2016 (The Māori Language Act 2016) to lead the revitalisation effort of te reo Māori on behalf of iwi and Māori. The act was passed in Parliament on 14 April 2016, it was written in te reo Māori and English, with the Māori language text prevailing. It replaced the 29 year old Māori Language Act 1987. What is the Maihi Māori? 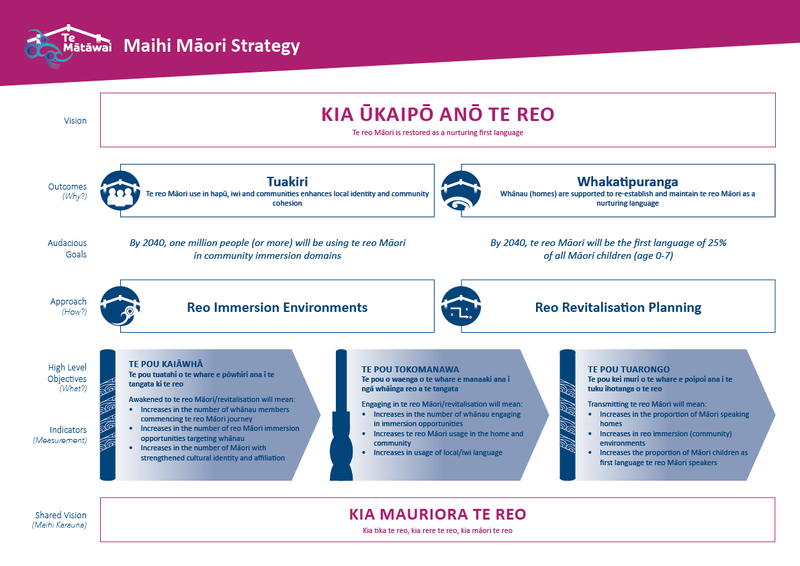 The Maihi Māori is a new Māori language strategy developed by and for iwi, Māori and Māori language communities/stakeholders. How was the Maihi Māori developed? Earlier this year Te Mātāwai (through our iwi and sector Board members) met with iwi, Māori and Māori language communities/ stakeholders around the country to gather feedback on Māori language initiatives in communities, their aspirations for te reo Māori and the role of Te Mātāwai in realising these aspirations. That feedback has informed the development of the Maihi Māori. Who is responsible for the Maihi Māori? We all are. Te Mātāwai will lead the implementation of the Maihi Māori, working closely with iwi, Māori, and Māori language communities/stakeholders on a range of investment and research initiatives. Te Whare o Te Reo Mauriora is new public policy developed as part of Te Ture Mō Te Reo Māori (2016). Te Whare o Te Reo Mauriora acknowledges the distinctive and complementary roles both the Crown and iwi/Māori have for the revitalisation of the Māori language, providing assurances around responsibilities and iwi Māori independence in respect of our language. The ‘whare’ recognises these two roles with the Maihi Māori being represented on the left side of the whare – the Taraiti where, traditionally, tangata whenua (the host party) is situated; and the Maihi Karauna being on the right-hand side of the whare – the Taranui which is a much larger space offered to manuhiri (guest). Being together in the same whare (house), both iwi/Māori and the Crown are drawn together by a shared sense of purpose for the revitalisation of the Māori language. What is the Maihi Karauna? The Maihi Karauna is the new language strategy developed (with advice from Te Mātāwai) by the Crown. It has a focus on better coordination between the multiple activities of Crown agencies and entities, to ensure outcomes for the Māori language are appropriate. The Maihi Karauna will focus on ways to ensure Māori language is supported at a national and regional level, and is complementary to the Maihi Māori focus on homes and communities. What are the key parts of the Maihi Māori? Developing a strategy focused on Māori language use in homes and communities is at the heart of the Maihi Māori. This is what underpins the Maihi Māori vision – kia ūkaipō anō te reo. Creating regional and national conditions that support language usage outside of the home, and ensuring access to rich, relevant and appropriate language is equally as important. Our advice to the Crown for the Maihi Karauna has focused on this and can be seen through their vision kia māhorahora te reo. Tuakiri is primarily about the ‘use’ of the Māori language - how it is both influenced and influences people depending on perceptions of identity and domains where reo and tikanga are normalised and have relevance. Whakatupuranga is centred around planning and awareness among whānau (especially caregivers), how they plan for future intergenerational transmission; how they set goals, problem solve and make decisions as adults for the raising of the next generation of first language (native) speakers. This recognises that currently for the majority of Māori, language revitalisation does not occur naturally, it needs to be planned to act against the pressure for language shift. WHAT IS UNDERPINNING THESE OUTCOMES? Far reaching goals are nothing new to iwi/Māori. A new strategy seems like the right time to get serious about setting goals for our future generations. Whāinga Rongomaioro or audacious goals proposed to support the overarching Maihi Māori vision and high-level outcomes of ‘tuakiri’ (identity) and ‘tupuranga’ (upbringing) will be aspirational but challenging. Set over a period of 20+ years, the goals consider the need to bring about sustainable change over multiple generations. They also rely on the ability of the Maihi Karauna to support national and societal change in attitudes towards the Māori language. The Maihi Māori Strategy recognises this as ‘the type of approach’ we will take. Or in other words, we will need to become familiar with the use of key language planning elements to drive language revitalisation outcomes. WHAT IS UNDERPINNING THIS APPROACH? This element places emphasis on Māori language revitalisation planning that is understood and actively managed by communities. This element has a broad reach and is focused on creating opportunities for communities and whānau to engage in Māori language immersion environments. The following draft (high-level) indicators that will be used as measures towards achieving the objectives and outcomes, are proposed under each of the above outcome areas.